The famous Canadian (but US-based) economist J.K.Galbraith once told us that “in economics, the majority is always wrong.” It was an exaggeration but there’s a lot of truth in his generalisation, which is why I like it when the views on whether stocks go higher are split, as they are now. Clearly, the US market is optimistic, with the indices tracking higher most days lately, despite a huge rebound since December 24. However, many might not know that since the mid-term elections in November last year, the S&P 500 is up a mere 1.3%. That was because global stock markets went through a horror December quarter. Christmas Eve put an end to that excessive, though understandable, negativity. 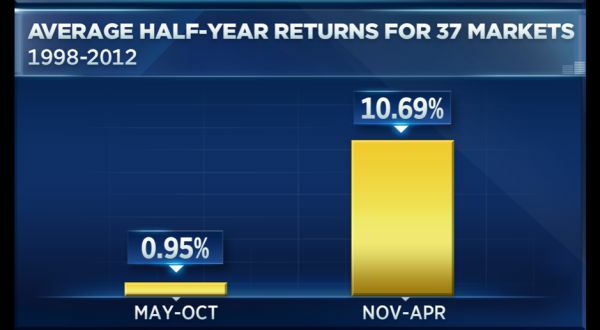 CNBC’s Yun Li has given us a timely history lesson, reminding us that: “Stocks have risen a year after the 18 mid-term elections since World War II, with the S&P 500 delivering an average return of 14.5%, according to LPL Financial Research”. I know history is no 100% reliable ‘rule of thumb’ guide but it’s a pretty convincing story that we need to link to what’s going on in key economies and governments, as well as their policy-making arms, such as central banks. Let’s face it, if central banks were all raising interest rates, growth was strong and inflation was surging, you’d be betting higher interest rates would eventually create a recession following a stock market boom, which then would fall into a bear market. But that’s not the current story. My sense of history tells me a sell off will happen this year and it could well be around April-May. That said, we know May can be bad for stocks but the old “sell in May and go away, come back on St. Leger’s Day” doesn’t always work out. This chart below shows a pattern that I can’t easily ignore. What the CNBC chart below shows is that our winter and the northern hemisphere summer aren’t great seasons for stock buying. So let’s try to assess 2019 ahead, based on what we can see that could drive stock prices and what history says makes sense. The third year of a US Presidential cycle is the best for stocks, with the fourth year the second best. Donald Trump can’t afford a recession and stock market collapse before November 2020, when the next election is due. I bet he’ll try everything to keep the growth show on the road. The Fed is no longer programmed to raise interest rates this year, instead promising “patience”. That takes away a negative factor working against stock market growth in the US. And we know how crucial Wall Street is for our stock market and other markets. Confronted with threatening economic slowdowns, governments and central banks around the world aren’t prepared to take a “hands off” stance. The EU central bank is making cheap loans available to banks and delaying interest rate rises. China has put its hand up for a big stimulus programme and locally we can expect that the election, with all its current negatives for the economy, will soon bring promises of tax cuts and spending programs, which should help raise economic growth levels, corporate profits and share prices. The latest news on the Budget projections from Deloitte Access Economics says the Budget Surplus for 2020 should be over $9 billion! Adding to the potential stimulus story here, I think the RBA is close to cutting interest rates, after two disappointing quarters of economic growth and weaker business as well as consumer confidence. There’s a virtual tsunami of money heading towards the stock market over the next couple of weeks in Australia that’s bound to help stocks go higher. Since mid-February, ASX 200 companies have paid out around $4.5 billion in dividends to shareholders. This has helped underpin the local stock market’s post-Christmas optimism but, as Ronnie Reagan once said, “You ain’t seen nothing yet”, with dividend payouts really starting to ramp up in mid to late March. “Overall, around $29.4 billion will be paid to shareholders over the February-June period, up from $26 billion in the August 2018 reporting season and up from the $22 billion in the February 2018 earnings season,” explained CommSec’s Craig James. But wait, there’s more that says stocks could have another leg up. The signing of a trade deal. Even if it’s not on the old expected date of March 27 and ends up being in April, there’s still bound to be uncertain types who won’t invest in trade-sensitive businesses until they see the deal. And the US President’s interest in Wall Street might prove critical. 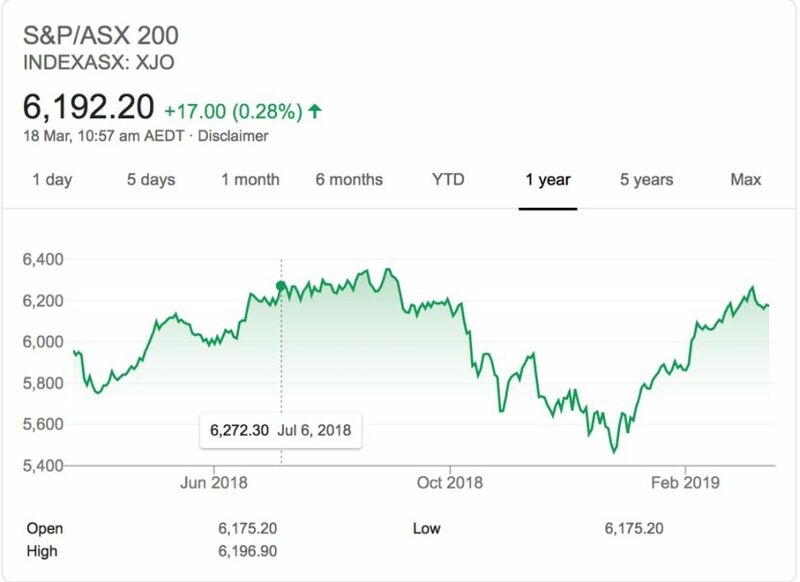 Right now, our stock market is doing well with the S&P/ASX 200 Index up 13.2% since December 24 but we have a fair bit of ground to make up in order to be where we were before the second-half sell off we saw in 2018, as this chart below shows. We’re now at 6192 but we were at 6352 in late August, when we had trade war talk, higher interest rates in the US expected, Royal Commission market fallout effects and house prices sliding. Apart from house prices, most of this has changed for the better. You can put more money to work here and if you’re a profit-taker, you can probably wait for some higher share prices before you do what you do. I expect a mid-year sell off but nothing akin to the 2019 stock dumping but that will be another buying opportunity. I don’t think we have ever had a US President like Donald Trump, who’d do what has to be done to dress up the ‘store window’ featuring the economy and the stock market. Only a curve ball thrown by a black swan, if that’s physically possible, could cause me to be wrong. On the local front, a post-election relief rally makes sense. If the Coalition surprises and wins, the rally would be bigger. But as long as Bill Shorten says the right things, showing that he has become a Prime Minister rather than an Opposition leader trying to win votes, then the stock market could go higher simply on the election being out of the way. If he doesn’t behave like a PM governing for all and with a healthy respect for the economy, then he could be bad for stocks.